I did it, I finally made something on my sewing machine! I’ve been attempting to make a collared shirt out of muslin (practice fabric) for a while but kept getting stuck at steps. After realizing that this was probably too advanced for a first project, I started with a dress pattern that had the words “EASY” on the front. Much better choice. 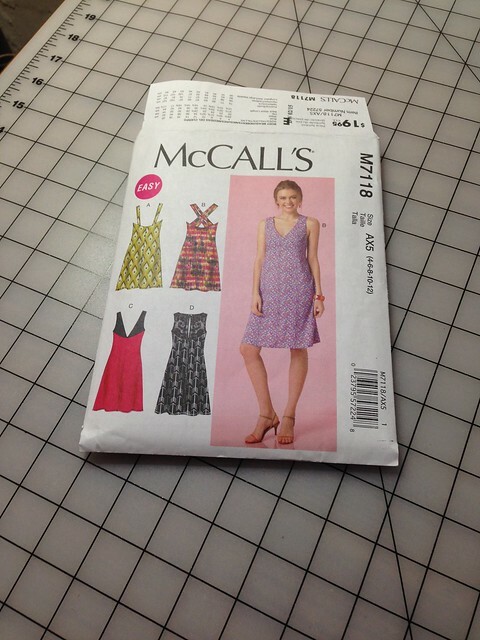 As you can see, the McCall’s 7118 is a simple dress with minimal fitted areas. 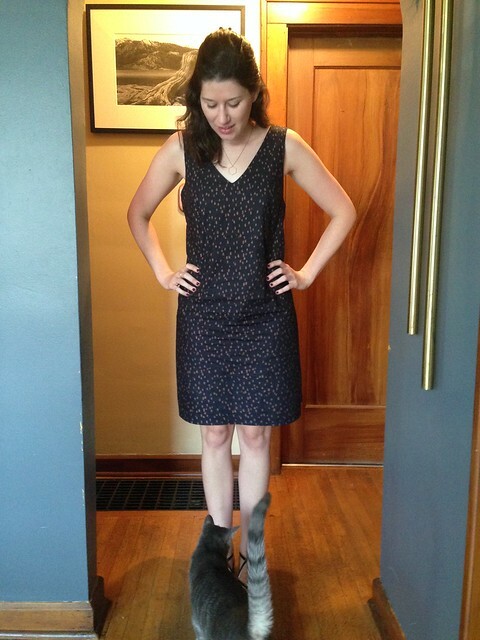 Essentially a sack dress. I chose to do the version A with straight straps. According to my measurements I cut a 12 from the pattern (for those not familiar to sewing these are different from store dress sizes. 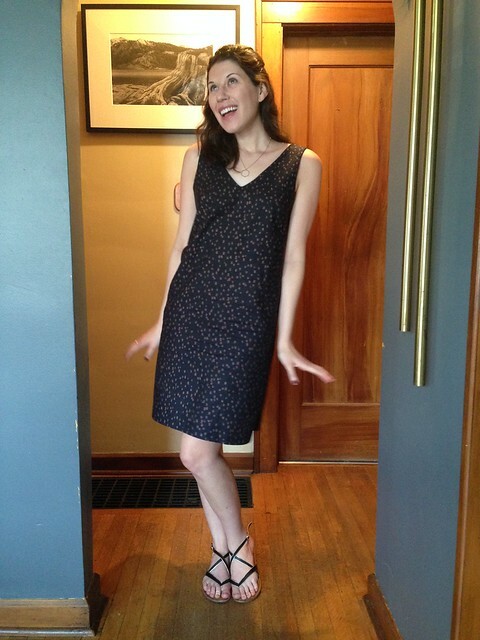 I am typically a 4-6 in dresses). In hindsight I probably could have cut a 10, but you have to learn some how. I chose a woven cotton fabric for this, bought 2 yards and 1 yard of fusible interfacing. 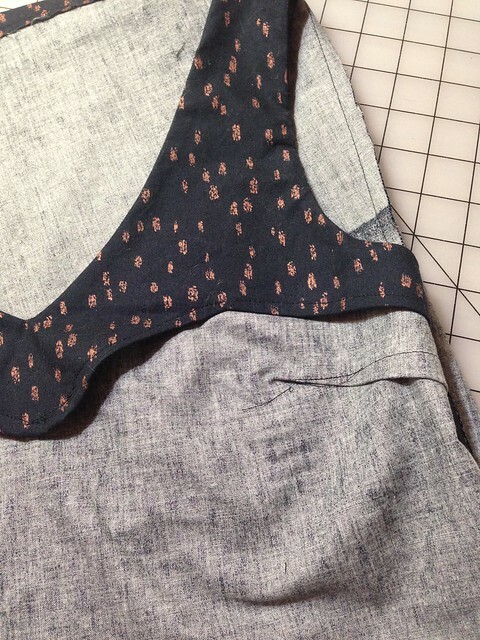 I pre-washed the fabric, pressed it, then cut out all my pieces. 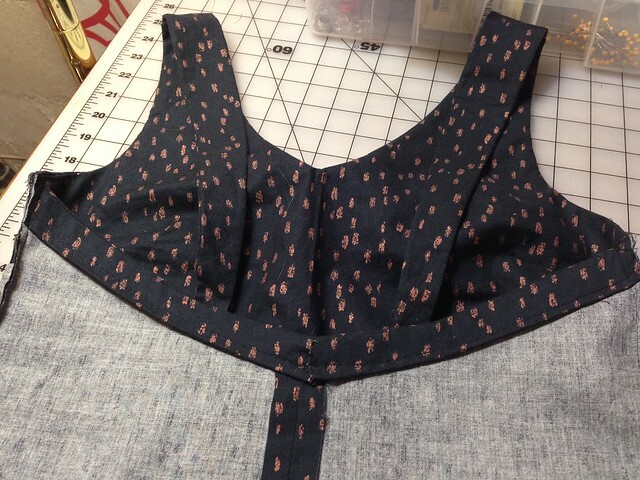 First the interfacing was fused to its respective pieces, and the straps were stitched. The back pieces went next, then the back facing. Facing confused me a little bit (for you non-sewers this part attaches the straps to the back and gives it a nice finish, also adds support) but the back was quite simple. Attaching the front facing is where I ran into challenges. The front facing was very curved; convex and concave curves. To finish the bottom edge I took it really slow since I am not yet that great at sewing anything other than a straight line. It wasn’t too bad. After I attached the facing to the front of the dress and flipped it inside out I was sure I made some other mistake. The fabric pulled and bunched and would not lie flat. However, after watching a youtube video I learned how to fix this by sniping to the seam line at the curves and to take out a lot of bulk at the seam. There is still a little pulling in the strap.My first mistake was that I attached the straps in the wrong direction. Where they were supposed to curve inward, mine curved outward. This meant that to attach to the shoulder they were going to have to cross, rather than lie flat. I though maybe I could squeeze by and just cross them (like in version B) but nope – not enough fabric. I ended up taking out the straps, flipping them, and then re-stitching them to the facing. Once this was corrected, I attached them to the front of the dress with the front facing. From here it was mostly easy street. I stitched up the sides and then the hem and was done! Or so I thought. 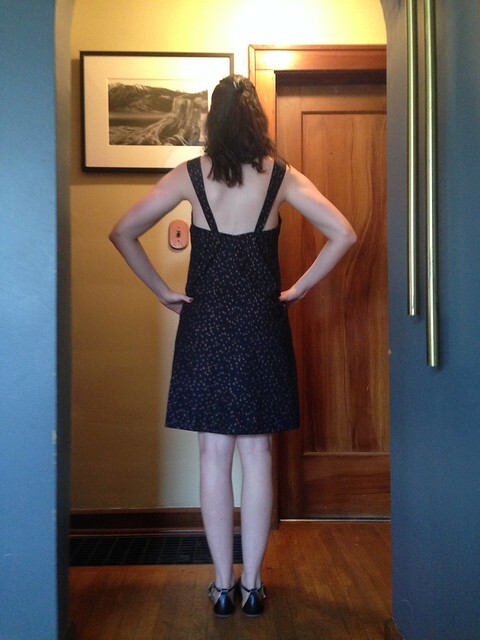 The first fit was much too loose around the torso, even for a loose fitting dress. I ended up taking in the side seams by about 0.5 inches each which solved the problem! It still doesn’t fit perfect… but I not going to worry about that! I also don’t know that much about finishing seams (making them neat and tidy so they don’t fray) so most of mine are raw. I’ve messed around with a little bias tape, and french seams, but right now I’m fine with it as it is. Honestly I am just excited I made a thing! A thing that I can wear!! In total it took me 3 days, maybe 6 hours total? Now what do I make next?